Our funeral Stationery printing service can supply funeral order of service, memorial cards, memorial bookmarks, funeral attendance cards. We have a range of designs that you can choose from when creating your funeral stationery, you can see some of our funeral stationery range at the top of this page, we have created a dedicated website to our funeral stationery, you can view our full range of funeral st ationery products by visiting www.funeralprograms.co.uk. We print and deliver nationwide including Norfolk, Essex, Cambridge, London, Ipswich, Norwich, Sudbury. We understand how hard it can be when you lose a loved one, we offer a personal service so we can work with you to create a fitting tribute to your loved one. When it comes to funeral printing we pride ourselves on providing a professional funeral printing service. 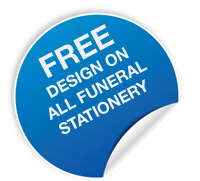 Let one of our experienced funeral printing designers work with you on your funeral stationery to ensure that you get exactly what you want. Fast delivery is available on all of our Funeral Printing, we use the latest digital printing equipment to allow fast turnaround. We deliver Funeral Printing to the following areas.